We are re-tooling to provide you the best quality "Theatrical" performance possible. While our former show "Necrovision" provided some idead of a theme with the costuming, it fell way short of the show I had imagined back in 2003. Mostly because of budget restrictions, limited positive cash flow, and a lack of determination on my part. That will not be the case this time around with "Debaucherous". I've started off by modifying my lighting truss such that it'll have sloop rigged sails attached stage left & stage right. To give you the impression that we're playing aboard a ship. And I'm also securing the services of a commercial motion picture supply warehouse for costuming needs. 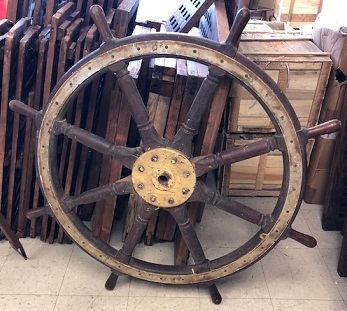 There will be stage props, including a microphone stand for the lead singer that looks like the helm of an old wooden schooner. (See example picture to the left). And much, much more. You have to start somewhere & I chose to begin with the visuals. ~ le Marquis de Ceas'd. Debaucherous is holding auditions starting Spring 2019. The snow is finally letting go of its tenacious grip & giving way to fairer weather. So I'll be on the watch for a new crew & building interest in the show. Stay tuned & I'll have something more news worthy shortly.